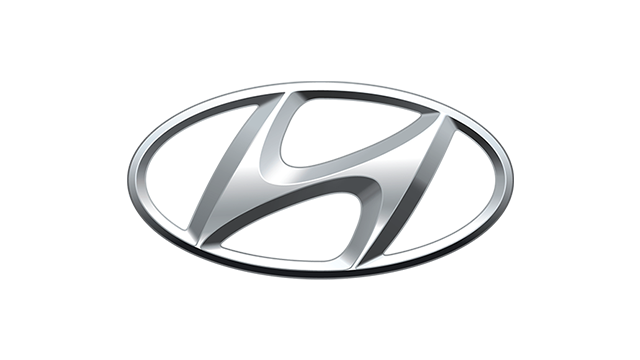 The waiting lists for these models are off the charts, tempting unscrupulous dealerships (shame on them) to take advantage of the situation and require even cash customers to buy through financing (preferably the dealers' in-house financing). But that's another story. The big story here is this group of five desirable SUVs that inspire people to work hard and save up for a unit. The ultimate fruit of their labor, if you will. 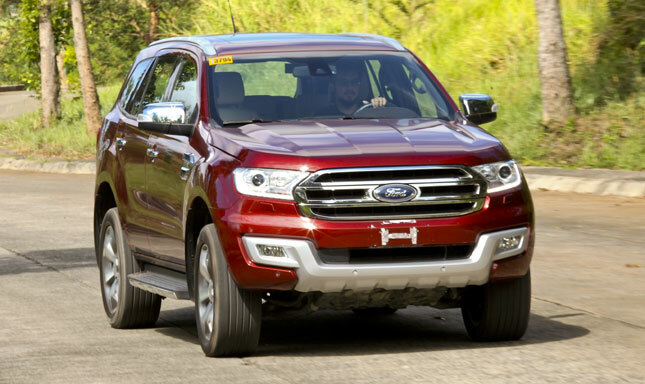 For this Big Test, we assembled the top-of-the-line variants, all 4x4 and all powered by turbodiesel engines. These five dudes were assigned one model each, but all of them were able to try out the five SUVs for themselves. In the end, the writers ranked the five SUVs based on performance, specs and features, and value for money. Because this is a rather lengthy piece, we're using jump pages to separate the five SUVs plus the verdict. Kindly bear with us. We've always frowned upon forcing readers to click on links for the sake of page views, which is why every article on this website is presented on a single flowing page. But we're making an exception for this one, just because it's really too long to be laid out on one vertical page. 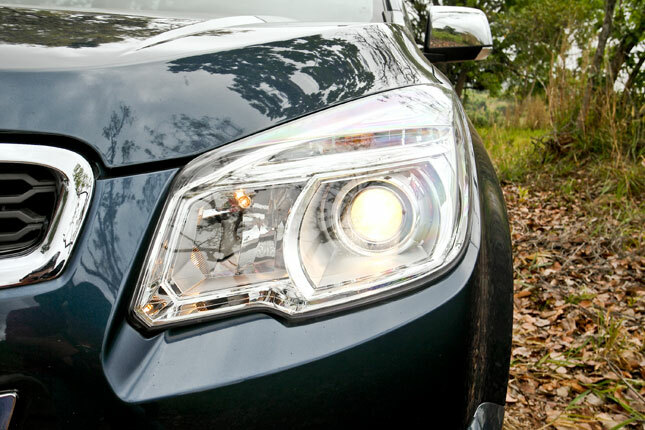 It is our hope that this comparo will help you with your SUV-shopping, and ultimately assist you in arriving at a decision that best suits your motoring requirements. 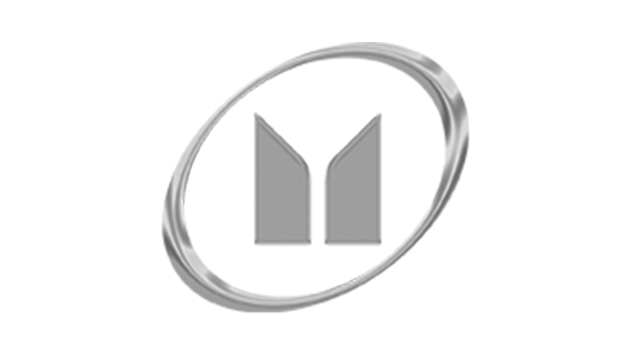 Having said that, we encourage you to analyze each evaluation and specs list, and then figure out for yourself which SUV truly matches you and/or your family. The winner in this Big Test may not necessarily be what you need. We're not telling you to automatically buy the SUV that places first in our rankings. There are other factors to consider. The verdict in this group test is the result of plain driving and model juxtaposition. We have no idea what each one of our readers is specifically looking for. UPDATE as of June 11, 2018: The new Tax Reform for Acceleration and Inclusion (TRAIN) law has been in effect for a couple of months now. And we're certain some of you guys have noticed an increase in your monthly take-home pay. The extra cash will probably come in handy paying for bills, refueling your ride, or just splurging on things in general. But did the TRAIN law help entice any of you guys to drive home a brand-new car from the dealership? It's a very timely question, especially considering how different the Philippine automotive landscape (and its price lists) looks after the tax law's implementation. 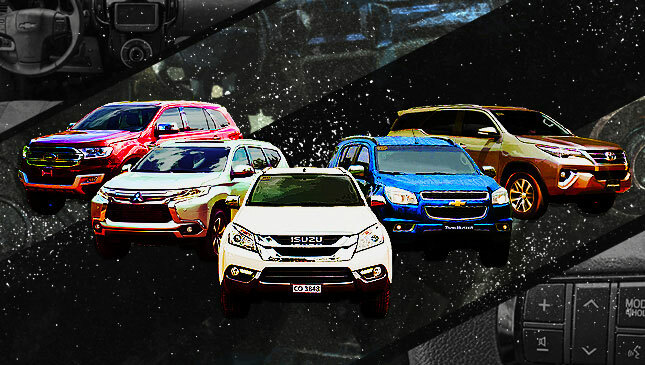 Follow this link to see the revised prices of all of the car brands in the Philippines. 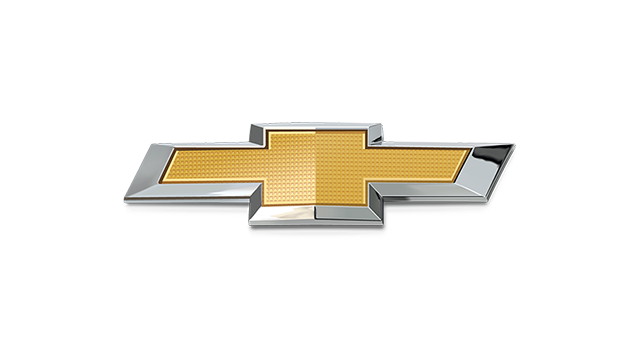 Most people associate the Chevrolet name with big V8s and muscular trucks. 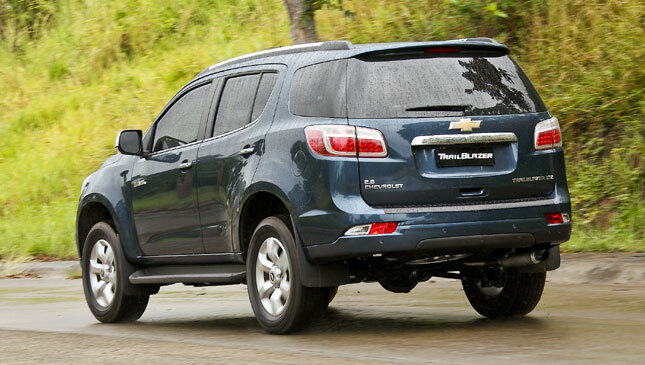 The last Trailblazer was a sporty midsize, American-market utility vehicle with an optional V8 engine. 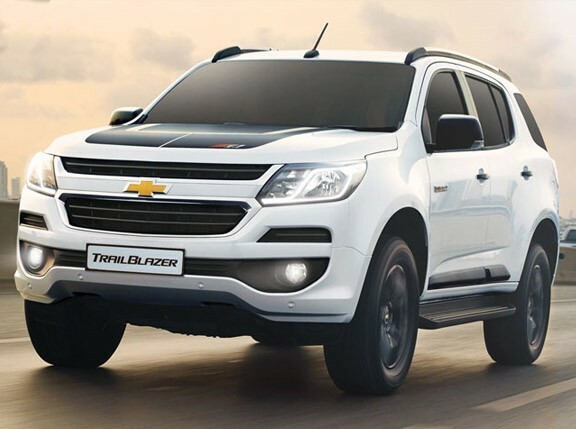 The new Trailblazer, an Asian-market PPV (pickup-platform vehicle) has nothing at all in common with that truck. The styling, though handsome, is fairly generic compared to the long-and-low American 'Blazer, and it doesn't even come with a V8. But it's hard to feel shortchanged when you bury the throttle and roar off into the sunset. This is the quickest SUV here by far. But despite this class-leading performance, there's no denying that the class it belongs to has graduated to a higher level. 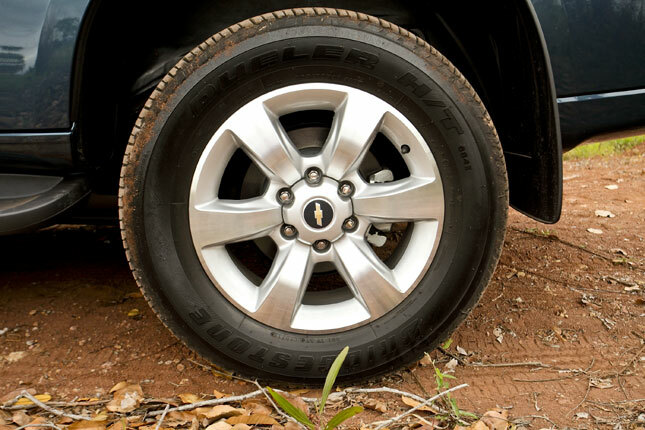 Hard to believe, but the Trailblazer, a product that debuted just three years ago, is now the oldest SUV on the market. What does this mean? 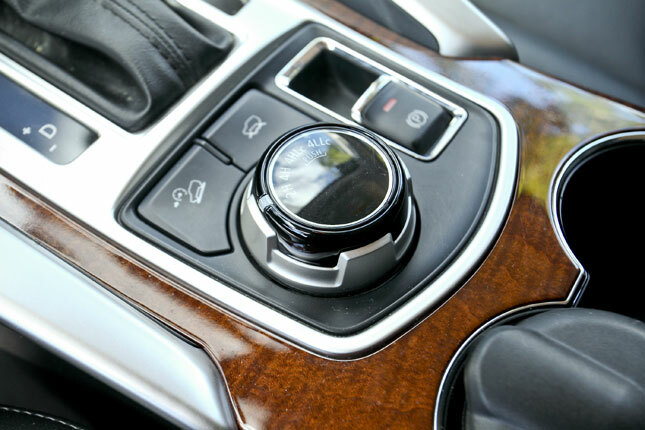 It means a six-speed automatic transmission that motorboats along instead of shifting crisply. 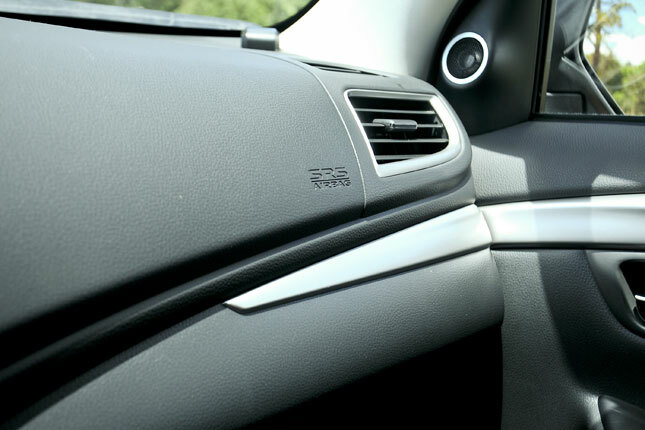 It means fewer excuses for Chevy's shortcomings in terms of interior plastic quality. And it means steering and handling that are truckishly heavy compared to the newer cars here. 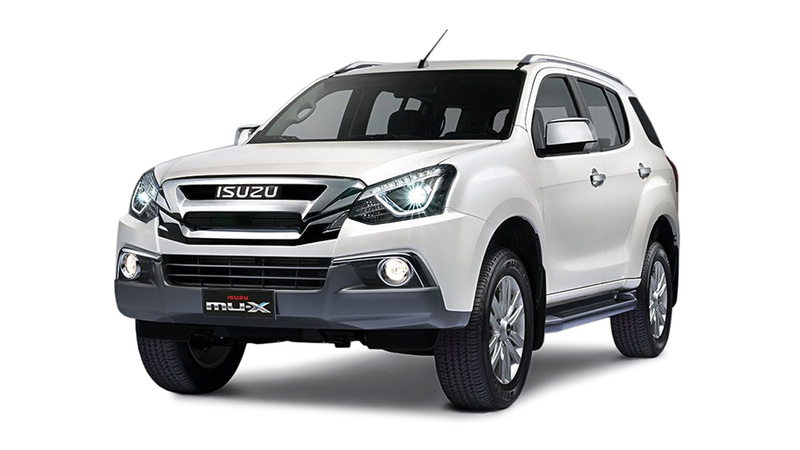 Worst of all, it means that the Isuzu MU-X, built on the same platform (albeit with brasher styling and the tried-and-tested 4JJ1 diesel under the hood), outsells its Chevrolet cousin handily. Let us just say, however, that if you are the least bit antisocial, this is the truck for you. Its 2.8-liter diesel, sourced from Italian specialist VM Motori, is still untouchable in terms of outright power. It's gruff, unrefined and a bit thirstier than the others, but 100kph comes up in nearly nine seconds flat. No other rival comes close. The ride is lumpier than in the MU-X, but sitting in the third row won't make you throw up. 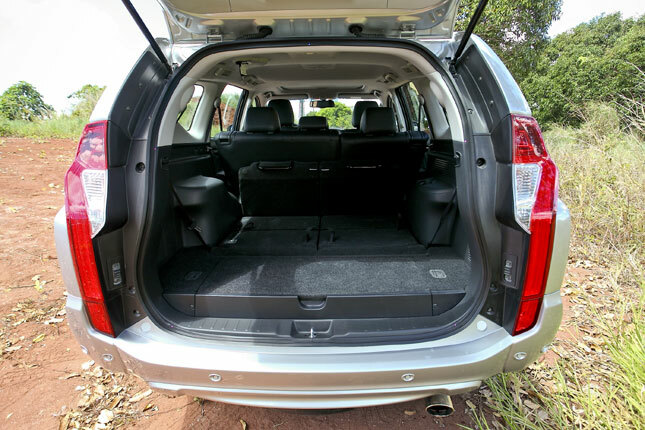 And the Trailblazer still leads the class with its 800mm wading depth, generous ground clearance, and three-ton braked towing capacity. 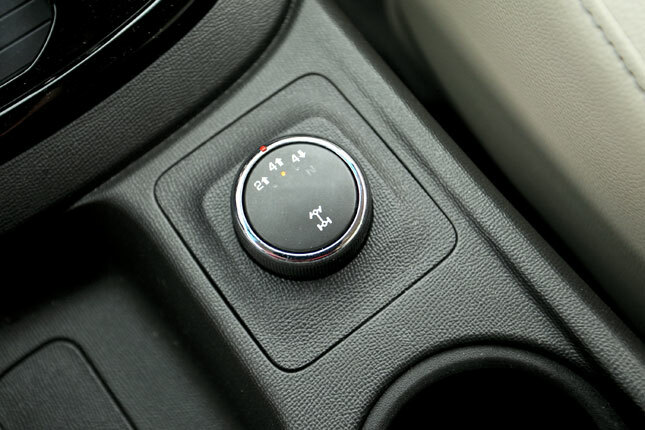 Newer trucks might match that towing capacity, but the Trailblazer's transmission temperature readout suggests Chevy actually expects you to use it. The accommodating and airy interior doesn't feel blue-collar. 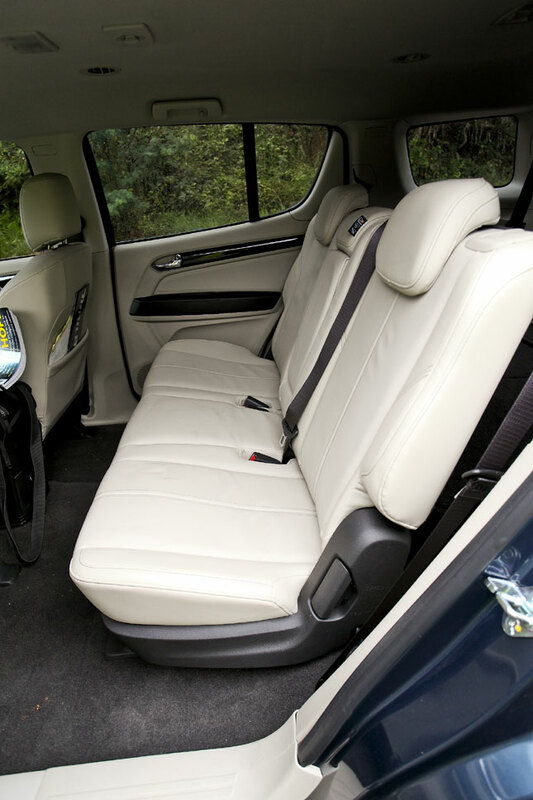 Space is good in all rows, although the third-row jump seats are rather flat and upright. 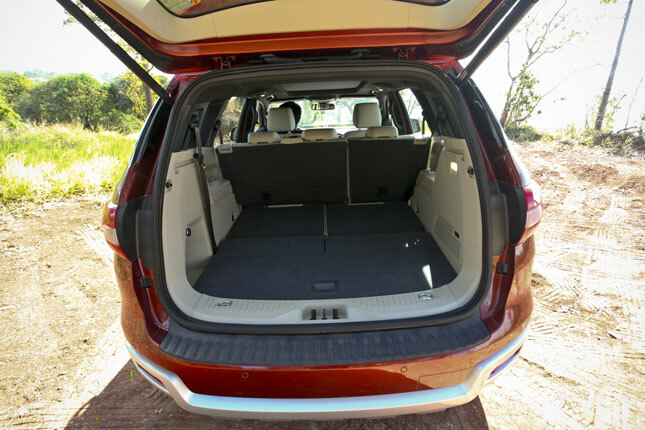 With those seats tucked away, cargo space is huge. 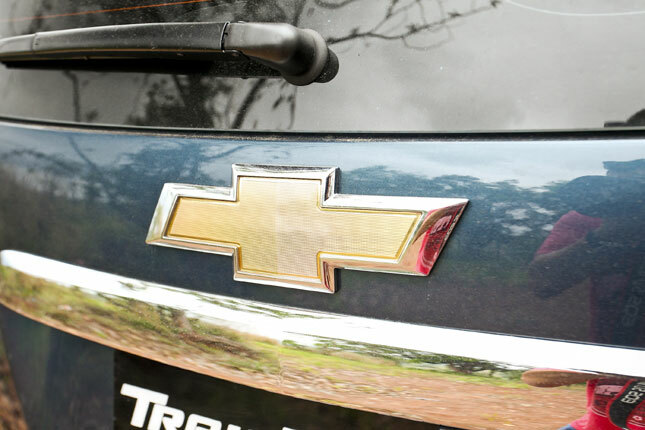 A new dash camera and tire-pressure monitoring system, as seen on the Colorado Tracker Pro, are welcome additions to the standard Chevrolet MyLink system, the first truly OEM touchscreen in the class. 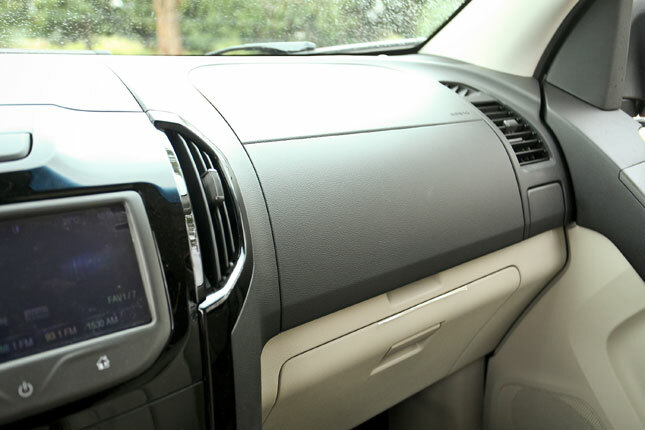 Though it's not quite as polished as the newer aftermarket units, it has all the bells and whistles: backing-up camera, navigation, and proprietary smartphone integration. We only used it to listen to FM radio, which it handled nicely. We're old-school like that. "Old-school" perfectly sums up the Trailblazer. Despite the plethora of electronic aids--HSA (hill-start assist), HDC (hill descent control), DSC (dynamic stability control), TC (traction control), ETC (et cetera)--it feels refreshingly like a retro muscle truck with its understated looks, big power, and an expressive color palette. Sure, the Trailblazer may not be the fanciest SUV out there, but for (literally) flying under the radar, it's the best there is. There's a two-month waiting time if you want to get your hands on an Everest Titanium variant with the Premium Package. 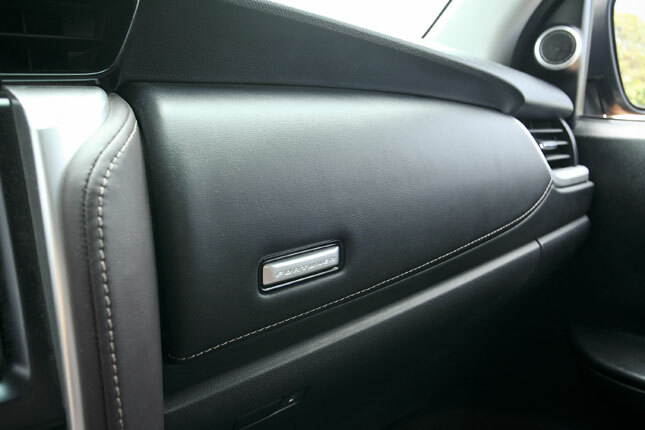 This is the trim level to have, actually. 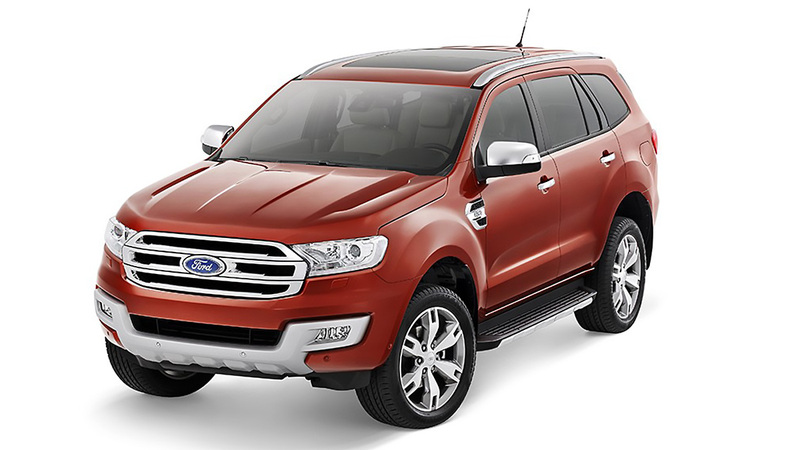 At P1.999 million, this Ford SUV is on the upper end of the price scale. However, it is the only one with a massive panoramic glass roof that stretches across almost the entire length of the greenhouse. Now, we don't know about you, but features like this get us all excited. Just imagine being on a long road trip with your entire family. You're cruising along a coastal road with the sun going down on the horizon, the open sunroof letting the sea breeze in, and the golden-hour light streaming through the glass. That's what awesome road trips are made of. The opulent interior is finished in a very classy brown-and-beige, and the fit-and-finish is excellent. It's very difficult to find any flaws. And when the car is on the move, gone are the crashing and squeaking sounds we've come to expect from ladder-frame vehicles. Everything is tight and quiet, with just a tiny bit of diesel-engine noise finding its way into the cabin. 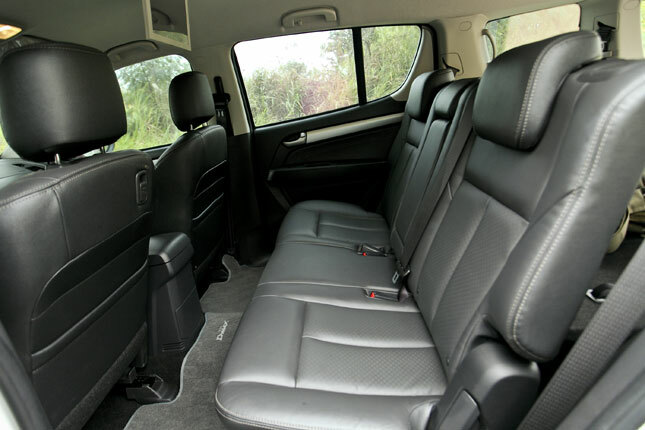 When it comes to isolation, the Mitsubishi Montero Sport is the only one that has a more tomb-like silence. Living with the Everest was a breeze during the loan period. Trips to Los Baños and back were stress-free. 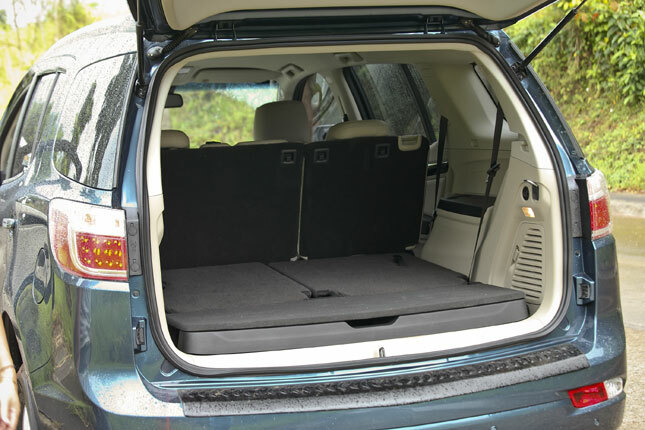 The fold-flat third-row seating can be raised or lowered at the push of a button, and the automatic tailgate comes in very handy. 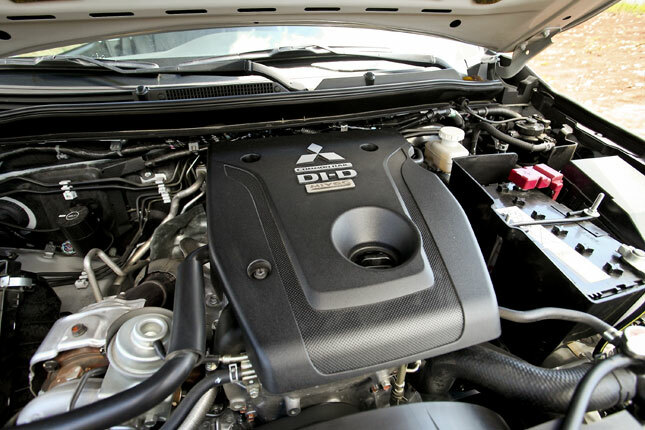 Under the hood is the 3.2-liter TDCi turbodiesel engine that delivers 197hp and 470Nm. Those are mammoth figures that more than suit our laid-back driving, but some editors in this Big Test group have commented that the Everest lacks a bit of high-end pull when the go-pedal is pinned to the floor on the open highway. 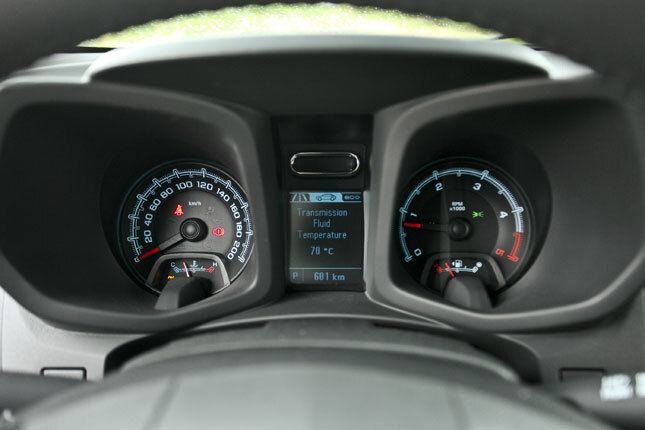 Combined fuel economy hovered in the 8km/L range, but that was because most of the time was spent crawling in traffic. 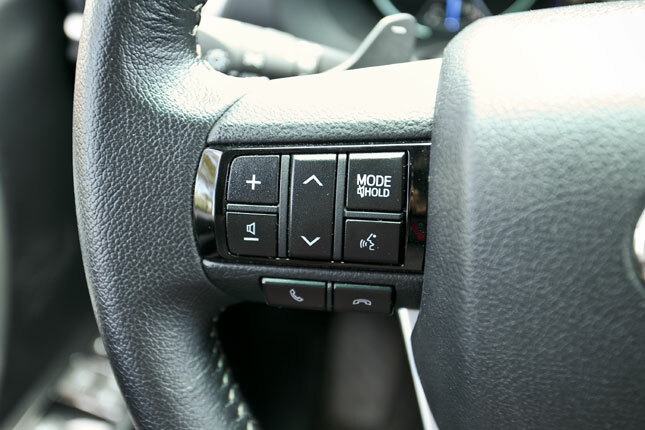 When the paved road ends and the dirt road begins, switching to 4x4 is as easy as turning a knob on the center console. We were worried about scratching the handsome 20-inch alloy wheels, though. For the geeks, hill-descent control is included as well, as are launch assist and a differential lock. The main niggle we have with the Everest is its super-light steering. There is no feedback whatsoever. 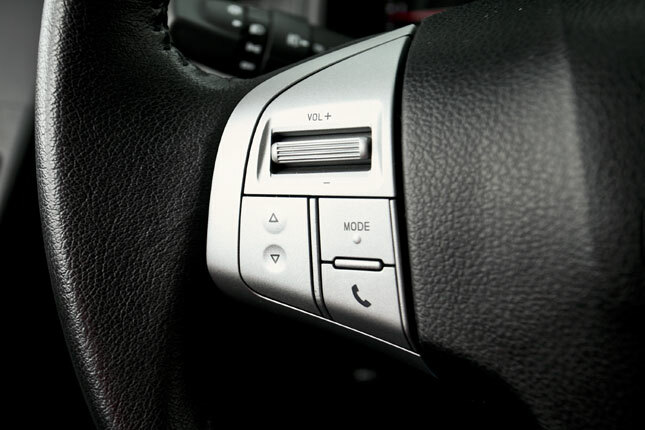 It's no wonder that lane-keep assist is a feature here, because the steering is way too light. 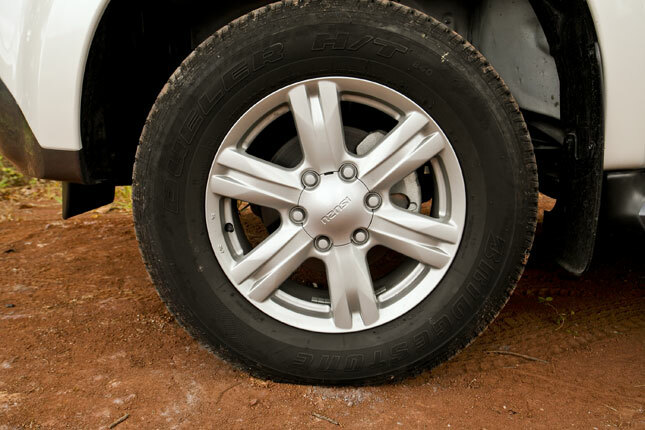 Another thing that concerns us is the sizing of the wheels and the tires. Yes, the low-profile 265/50 R20 rubber looks great, but it will cost a lot to replace when the time comes. What else does the Everest have going for it? 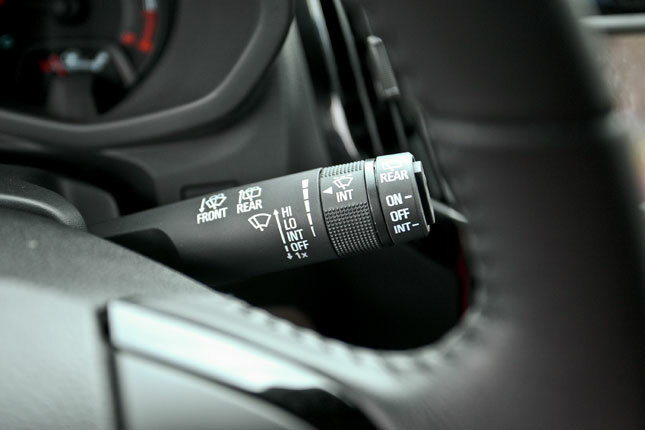 There's advanced safety tech like blind-spot information system with indicator lights in the side mirrors to let you know if there's a vehicle in your, er, blind spot; cross-traffic alert, which warns you if something is coming your way while you're backing out of a parking space; adaptive cruise control with collision warning; and seven airbags. Active park assist is cool, but not necessary. 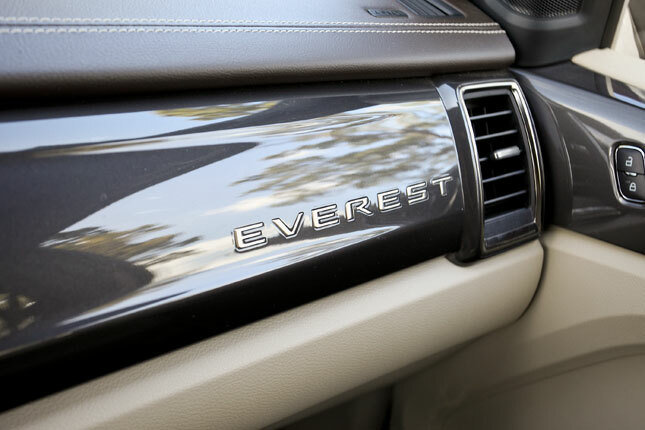 So yes, the Everest is pricey, but not only is it packed with so many tech features, it also carries with it a very desirable air of sophistication. That should explain the waiting list. The MU-X faces an uphill battle in this SUV mega comparo. 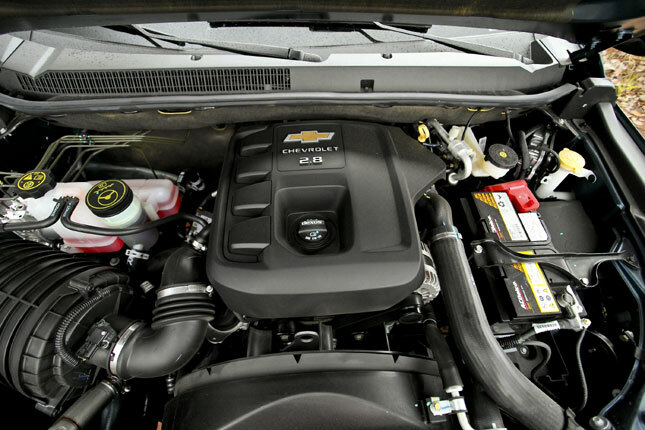 It's the second-oldest SUV in the lineup after the Trailblazer--with which it shares platforms--and even in top-spec form, it has the lowest power output. Does that mean it's automatically the least-preferred vehicle by buyers? Not by a long shot. 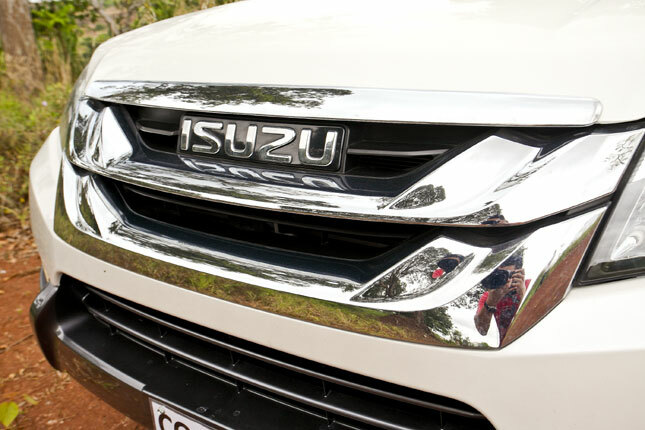 Of the new-generation midsize SUVs on the market today, the one from Isuzu has the most conservative styling, and this actually works in its favor. 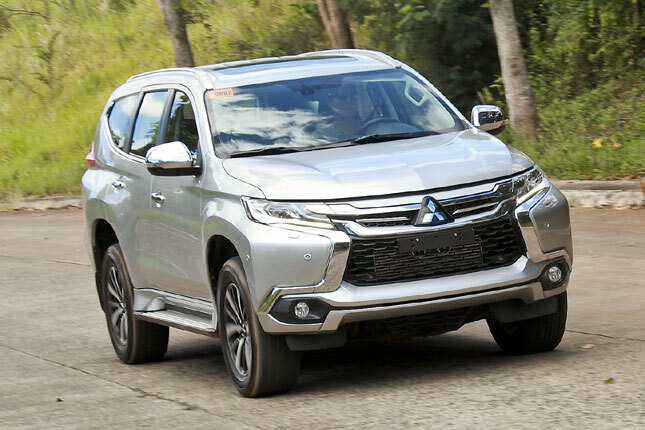 It doesn't have the cyber-ninja image of the Montero Sport, the upscale look of the Fortuner, the brawny countenance of the Everest, or the brutish visage of the Trailblazer. Instead, its safe appearance appeals to those who prefer tradition over trends. This MU-X flagship variant is the more powerful 3.0-liter LS-A 4x4. It's good for 161hp and 380Nm--27hp and 60Nm more over the previous top-of-the-line 2.5-liter LS-A 4x4. Surprisingly, the 3.0-liter sells at a more affordable P1.708 million--P40,000 less than the 2.5-liter version. 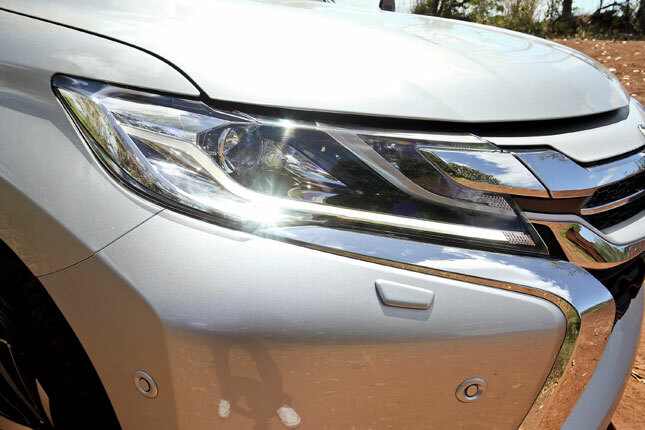 Visually, the only way you can differentiate the two variants is through the LED daytime running lights located right beside the fog lamps and the chrome muffler on the more premium version. 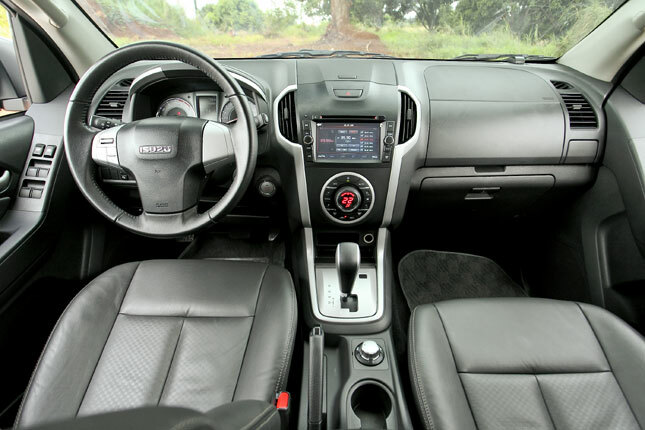 Inside, everything is predominantly black, save for the faux brushed-aluminum trim around the center console and the steering wheel, and the beige headliner. 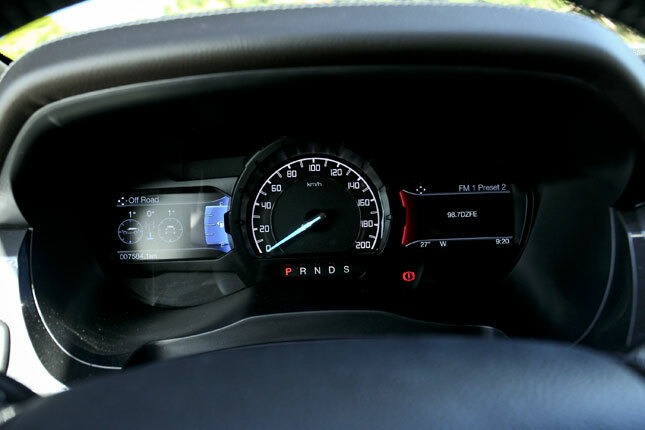 Incidentally, the MU-X also has the same dashboard design as the Traiblazer, with the only visible difference being the instrument cluster and the integration of the head unit. 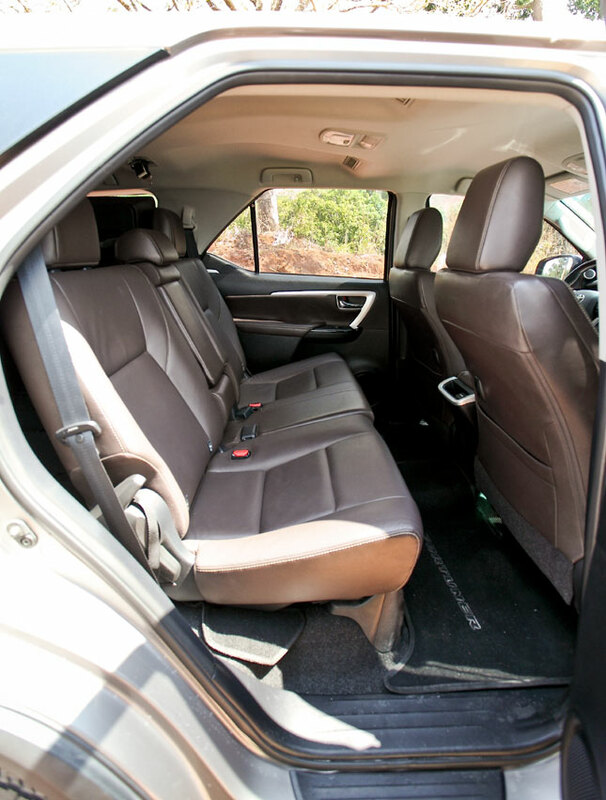 Both vehicles share the same weakness in the cabin, too: The third-row seats don't fold flat into the floor, so loading balikbayan boxes isn't a simple matter of just lifting and sliding them into the cargo area. That said, the MU-X probably combines the best of both truck and car worlds in this comparo. 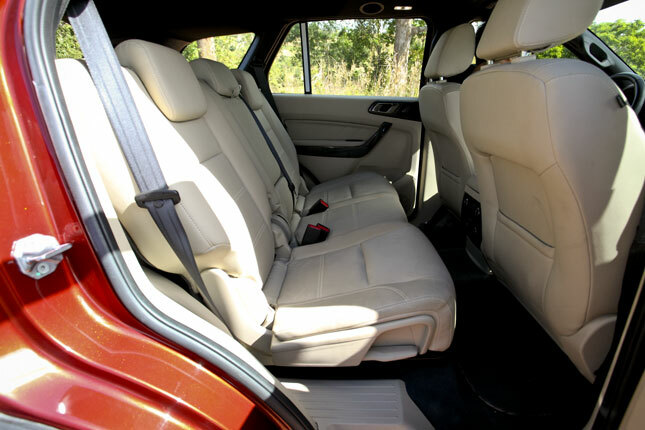 It's an SUV, no doubt about that, from the unmistakable diesel clatter of the powerplant to the ride height and the sizable heft of the body. Once you get moving, though, it feels like a leisurely crossover. 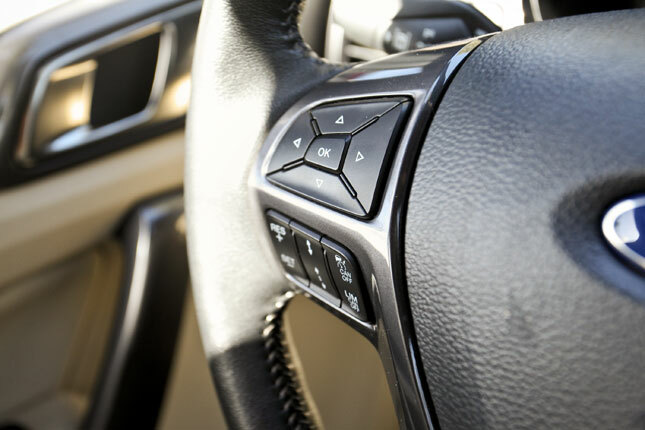 The steering is light for a vehicle of this size, and pressing down on the pedals requires less effort. 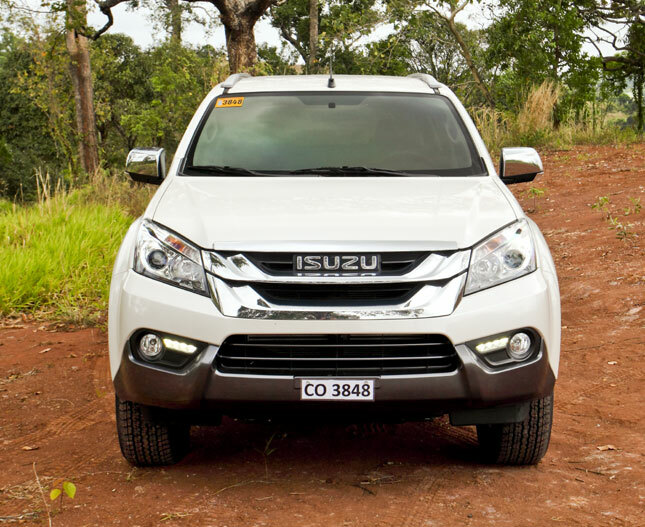 The Isuzu even rides like a car because there's none of the harshness so often associated with SUVs. Still, the sturdy suspension--double-wishbones in front, five-link coil springs at the rear--and the 4WD Terrain Command Select dial do give you the means to clamber over rocks on a mountainside, should you feel inclined to take on more adventurous terrain than a pebble-strewn urban parking lot. But despite all these superlatives, the MU-X pales in comparison with most, if not all, competitors here. Why would you buy one? 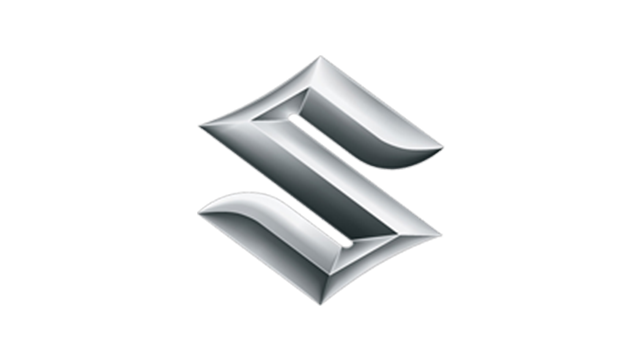 Because when it comes to trucks, Isuzu is always a safe bet. 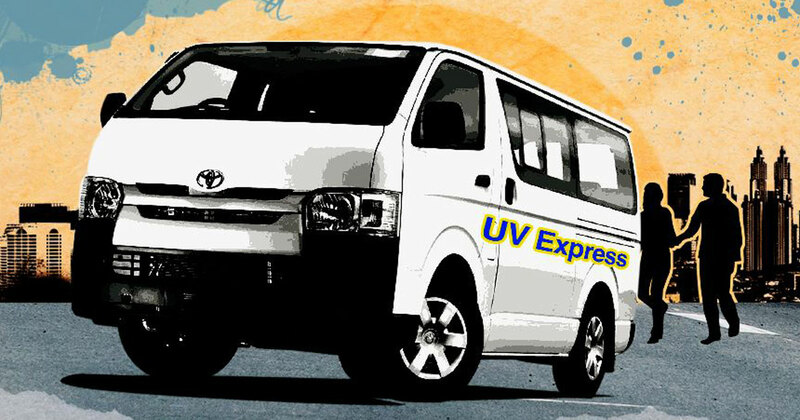 It has an extensive dealer network throughout the country, and spare parts are readily available. The brand's offerings also lack most of the electronic wizardry of the competition--high-tech systems that, once they break down, may very well turn out to be a pain to troubleshoot and fix. In short, the MU-X may not be the most impressive SUV here, but it will probably outlive its rivals in the years to come. If this contest were based on looks alone, the Montero Sport would blow the competition to the weeds. No one expected the final product to look the way it does. 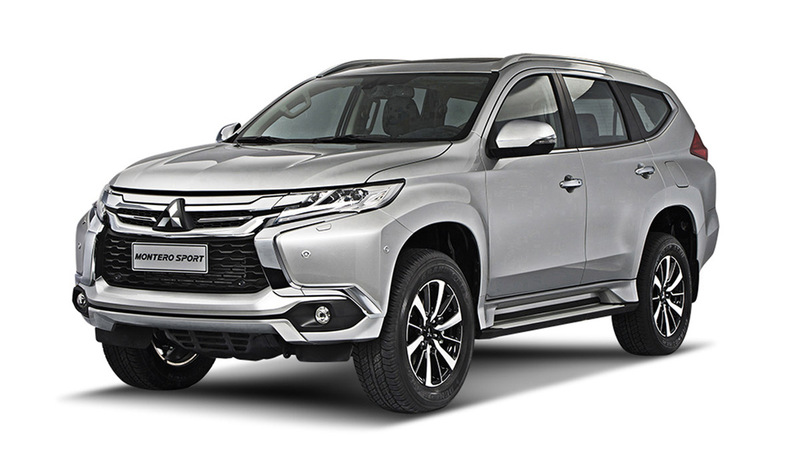 The Montero Sport looks like the GC-PHEV and the XR-PHEV concepts, with the front bearing the Dynamic Shield Design. The only resemblance to the previous generation is the familiar profile. 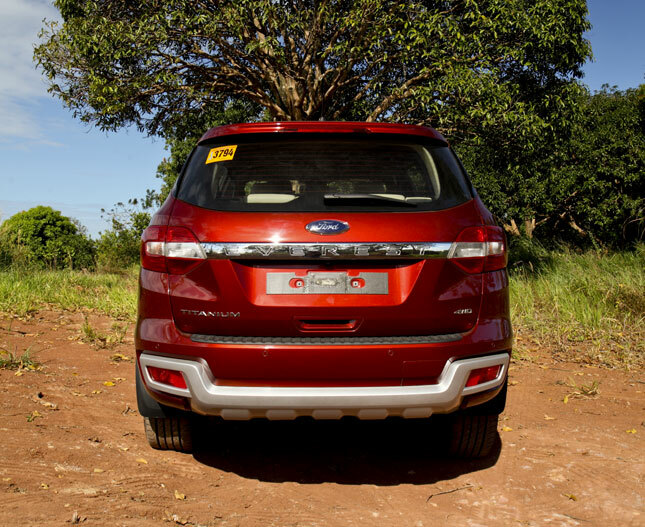 The taillights, meanwhile, draw mixed reactions, but we do like them--they mask the SUV's large proportions and give it a recognizable identity as well as added safety. Much thought has also been given to the interior. The steering wheel looks really good and feels nice to hold, with the right size and the right amount of fatness. 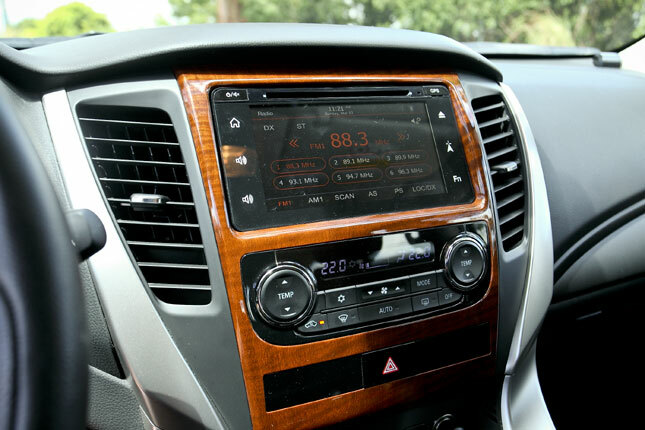 The wide and high center console attracts attention, too. 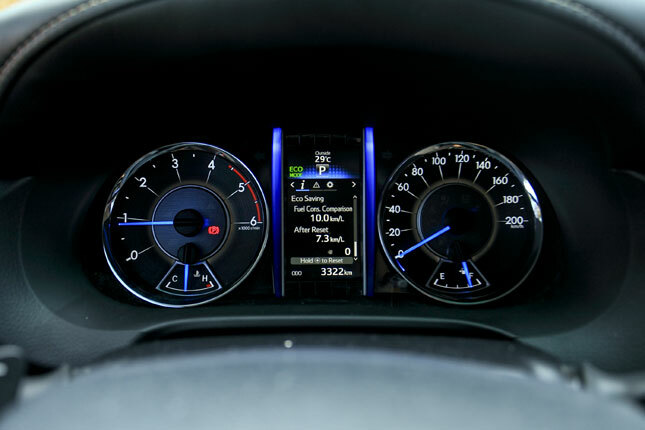 Overall, the dashboard setup looks like it could belong in the Pajero. 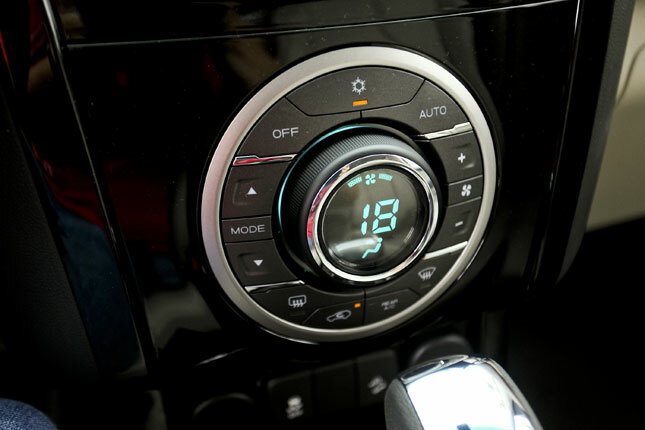 The info screen can display tire pressure like in Mitsubishi's upscale SUV, as well as air pressure and altitude--stuff useful for off-road excursions. The touchscreen is also more responsive than the Everest's. The seats are supportive yet not too firm. 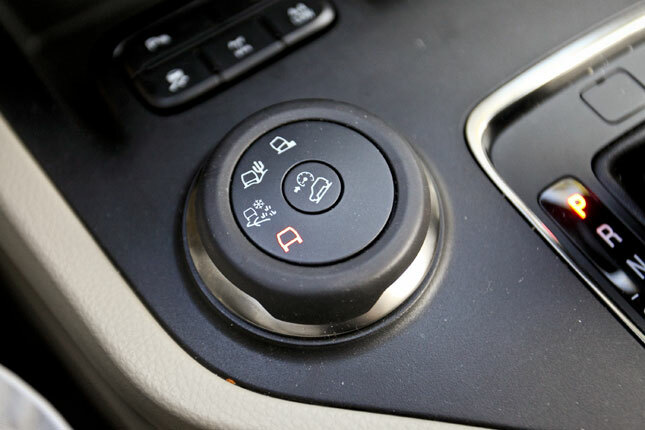 Eight-way power adjustment likewise helps you with the ideal driving position. 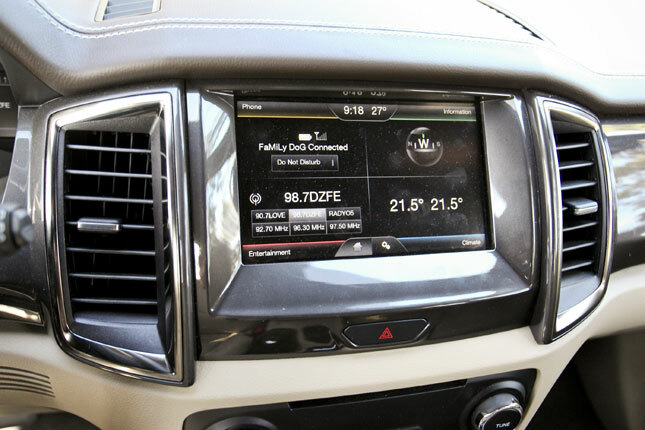 During a 120km media drive in Cebu, we didn't feel any strain inside this SUV. We find it to be the most comfortable in this bunch. The other seats are also comfy. 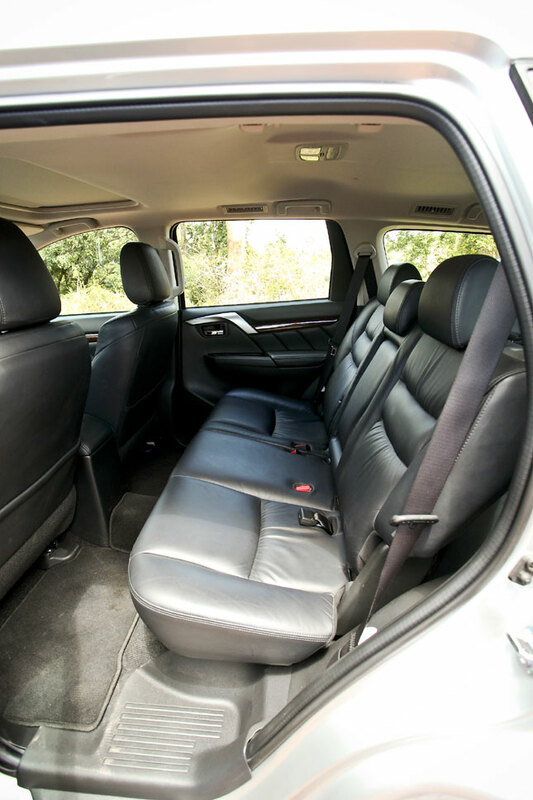 The second and third rows have been moved slightly forward and back, respectively, for more leg space, but they still allow for a good recline. 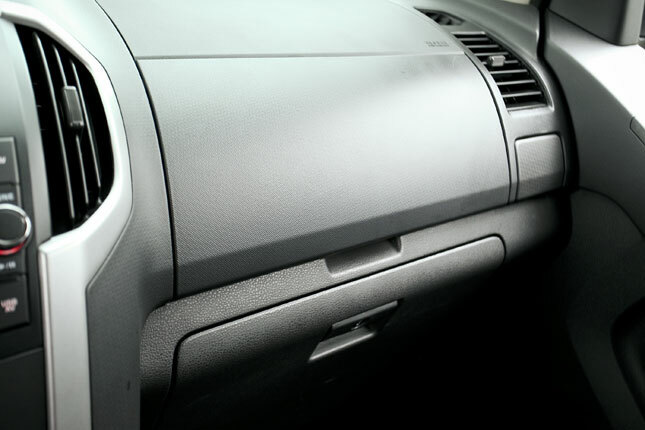 Even the headliner is contoured for taller occupants. Neat idea. 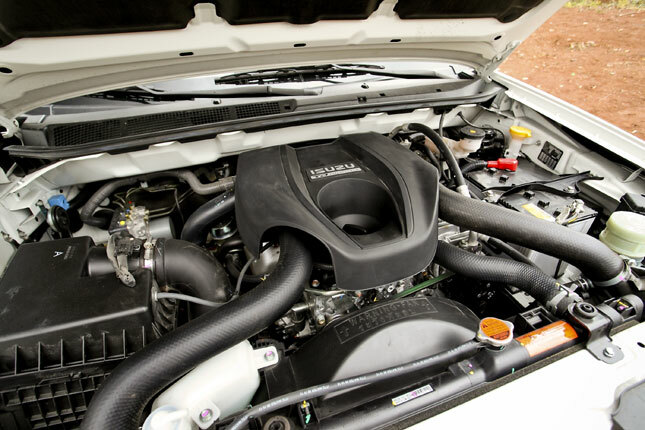 The all-new 4N15 2.4-liter turbo-diesel churns out 178hp and 430Nm. The engine is linear, and is tuned for better daily usability. It has more pull with less effort, thanks in part to the new eight-speed automatic gearbox, which is almost CVT-like in its smoothness. 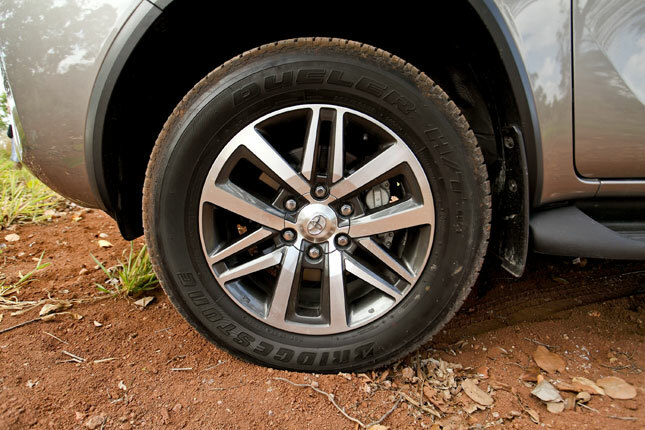 Some of the guys on this Big Test team think the Fortuner has more grunt. 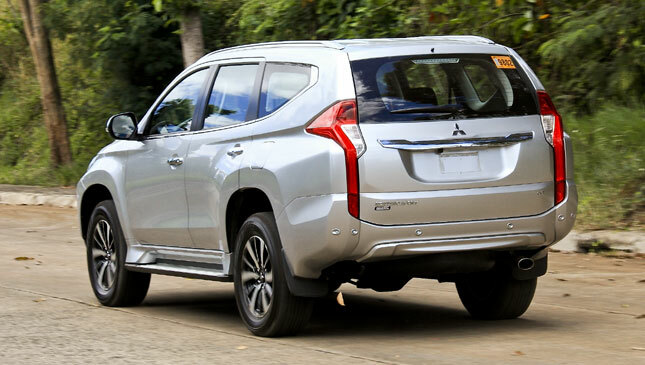 We find the Toyota and the Mitsubishi to be comparable in this area, with the Montero Sport smoother and more responsive in its delivery. 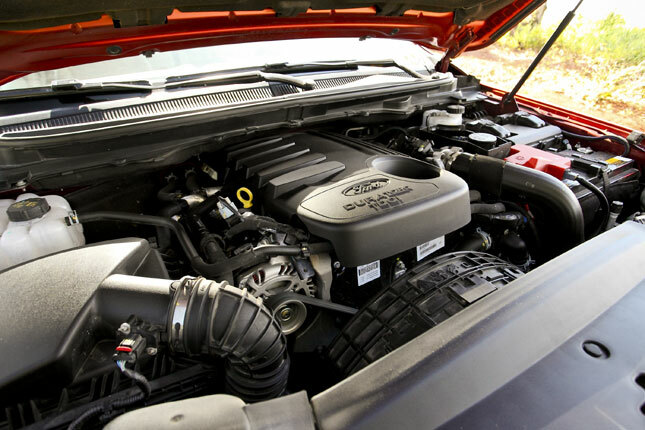 Ford's 3.2-liter mill, on the other hand, feels stronger at low end, given its emphasis on towing capacity. 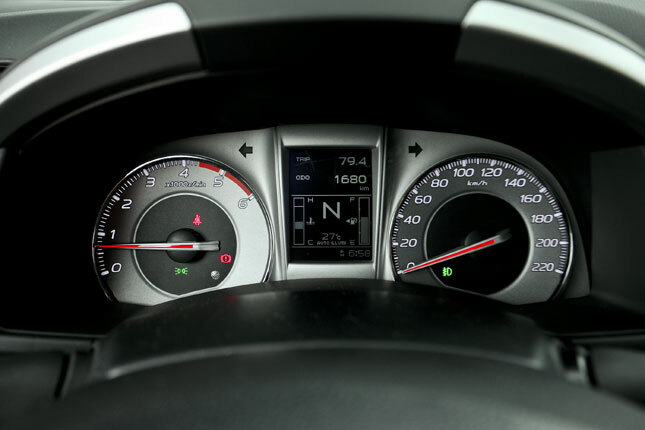 But it offers hardly anything past 3,000rpm, making it somewhat dull on the highway. The Monty peters out at about 3,800rpm. Over a week-long test, it returned 8.4-9km/L around the city. 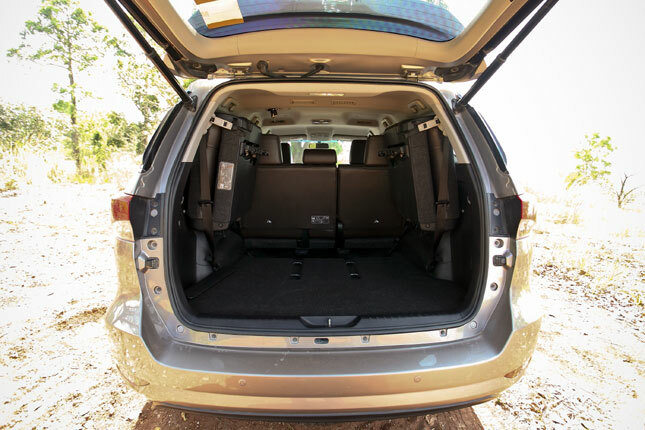 While these SUVs will, for the most part, be chauffeur-driven, the Montero Sport is the most driver-centric and most athletic of the bunch. It's longer than its predecessor, but it doesn't feel big. Hydraulic steering is retained and has the best feel here. This car also has the tightest turning radius. 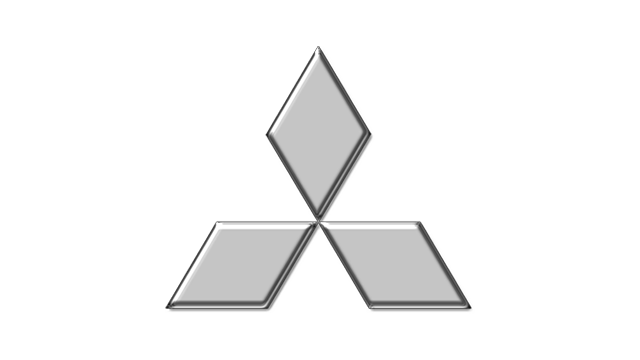 Ride-wise, meanwhile, the Mitsubishi is soft but not spongy. Rebound damping and spring rates are spot-on. The on-road manners translate to a nice and soft ride off-road because the suspension damping isn't too firm. It has good articulation and the body rolls with it. The looks are one thing, but it's when you're behind the wheel that you make sense of the effort put into the car. 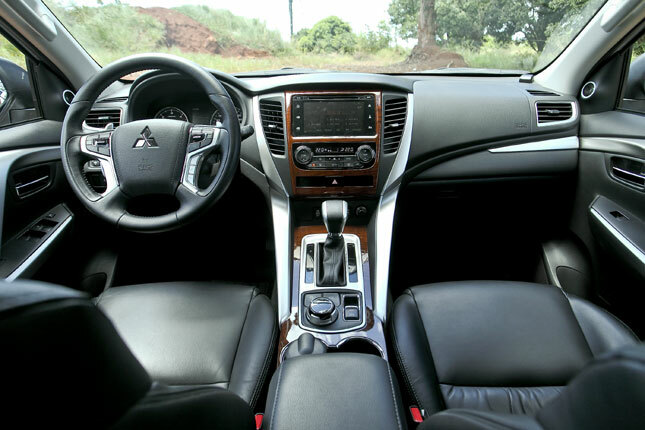 Mitsubishi has improved the Montero Sport in every possible aspect. But is it enough to keep rivals at bay? 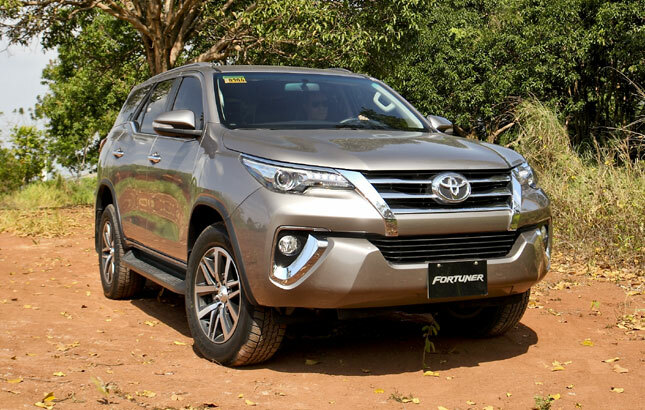 For the second-generation Fortuner, Toyota has addressed the complaints that buyers had with the preceding model. First off, the chassis uses enhanced box sections, making the platform stiffer and stronger, and thereby improving safety as well as overall performance. Ride comfort now borders on crossover-smooth, but it still feels very much like a proper truck. Turning radius has also improved to below 6m versus the previous 6.2m. 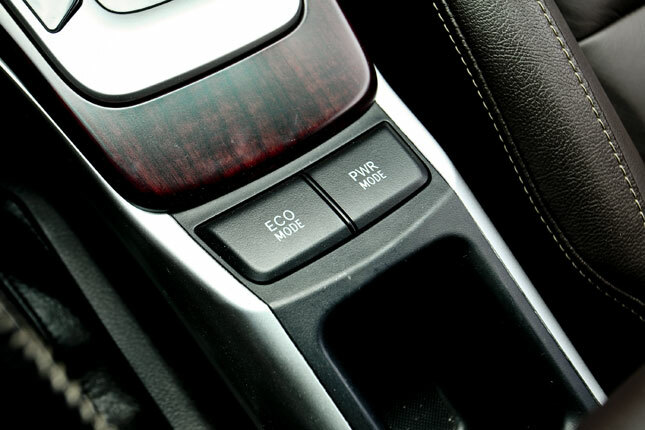 In the the top-spec V variant, the six-speed automatic gearbox is linked to a four-wheel drivetrain that comes with Advanced Traction Control or A-Trac, which regulates engine power, traction and stability aids, and ABS. 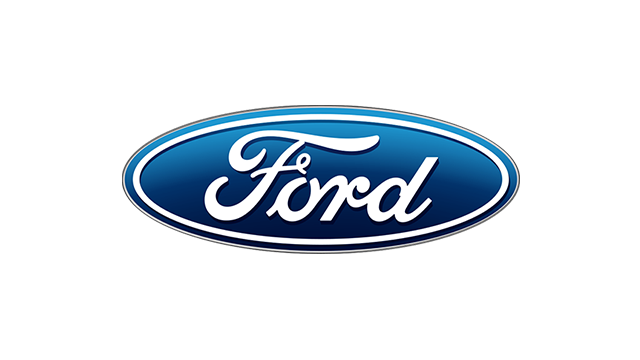 While it might not be as sophisticated as Ford's or Mitsubishi's system, it's just as effective in real-world applications. 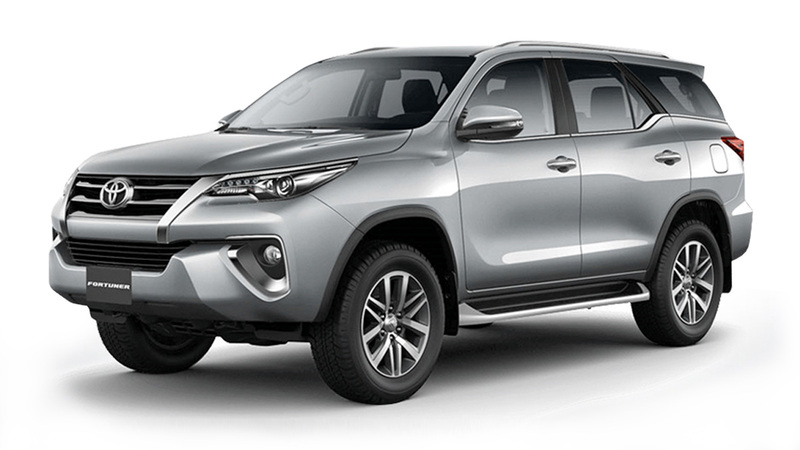 Shame that there's no differential lock, but the vast majority of people will use the Fortuner as a rapid on-road express that can tackle occasional off-road jaunts, flash floods, and poor roads. It is here that the powertrain and chassis upgrades can be felt. 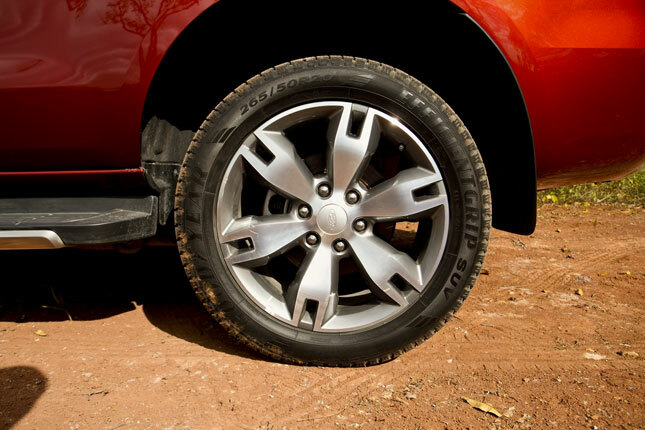 The ride is well-damped, and wheel articulation is excellent on rough roads. 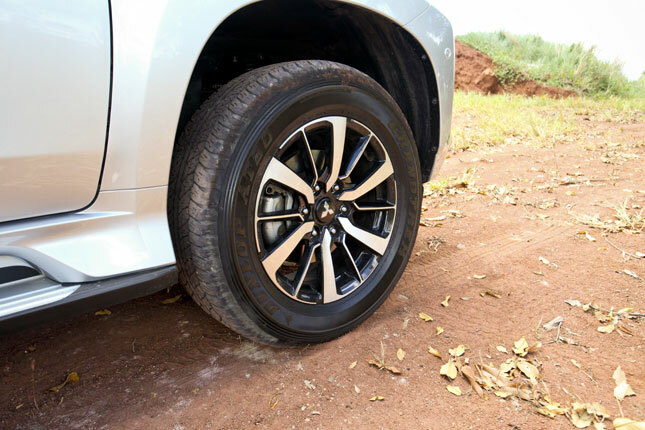 The 265/60 R18 Bridgestone Dueler tires provide a more aggressive stance, especially with alloy wheels that look straight out of a Lexus catalog. The suspension still utilizes the same live-axle rear setup, but you'd think it was underpinned with a more sophisticated multilink. 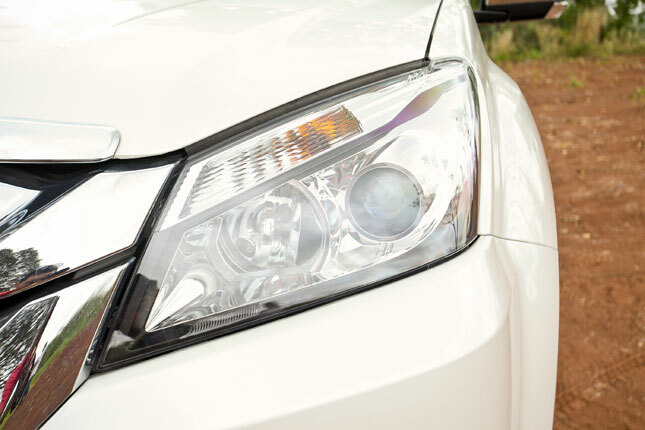 The ABS-EBD-equipped brakes have good modulation and feel. 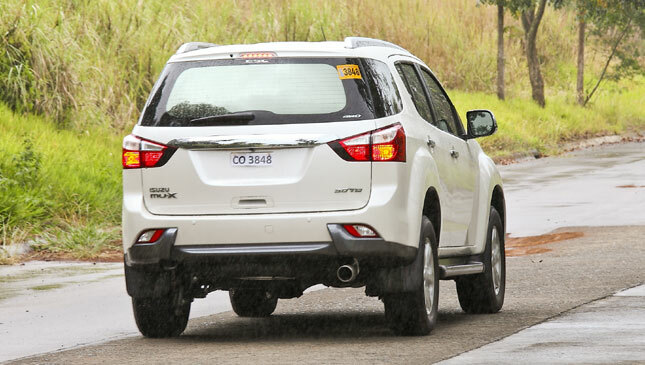 On the track, the Fortuner handles emergency lane changes and braking maneuvers well despite significant chassis roll and pitch; the chassis never feels flustered or overwhelmed. 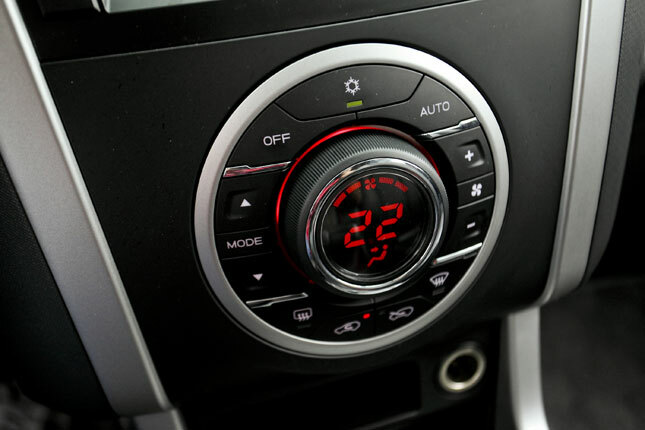 In terms of NVH levels, you don't get as much tire, wind, road or engine noise inside the cabin. Seating position is also vastly better. 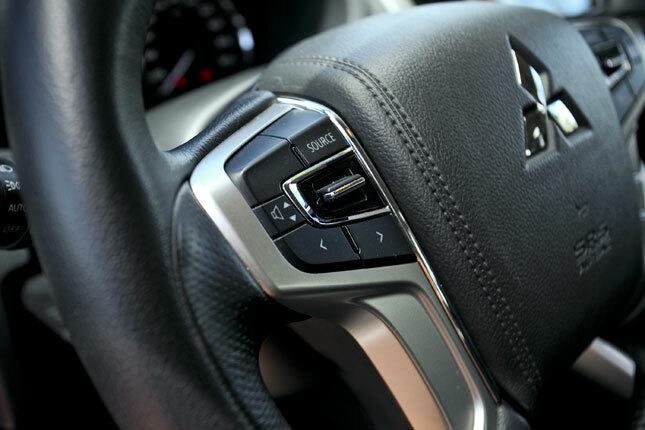 Toyota has improved the steering-wheel-column-to-shoulder angle, so there's less effort required whether during spirited driving or long cruises. Reach-and-rake adjustment is now available, but the latter could do with a couple more inches of pull. The steering remains light, but it now offers much better feedback and accuracy, and a more natural self-centering effort. 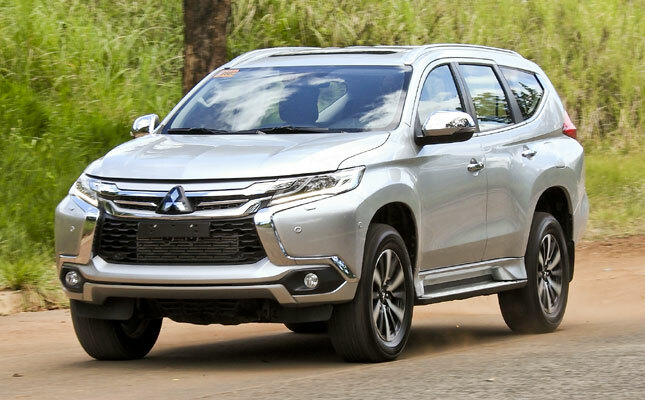 It falls short particularly compared with the Montero Sport, the latter feeling better-suited for long-distance highway use. 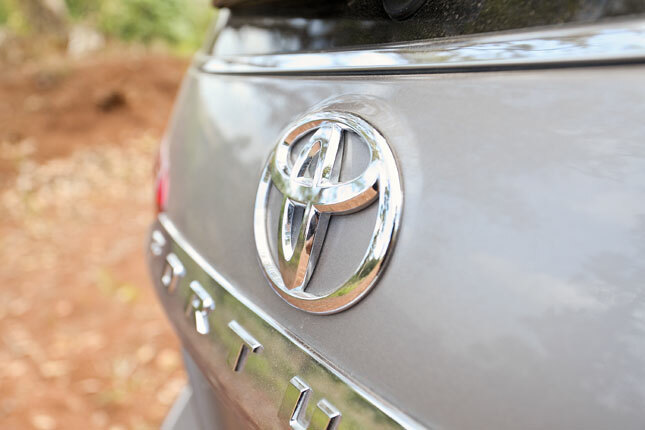 On the other hand, there's a sense of heft in the Toyota that the larger Everest seems to lack. Against the others, fit-and-finish here is the best in this motley crew. 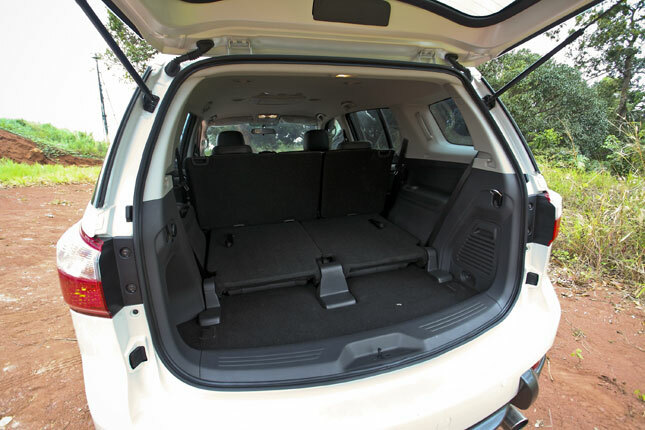 The cabin does lack the simple and sophisticated design of the Montero Sport, but it's far less gimmicky than the Everest, more refined than the Trailblazer, and more upscale than the MU-X. 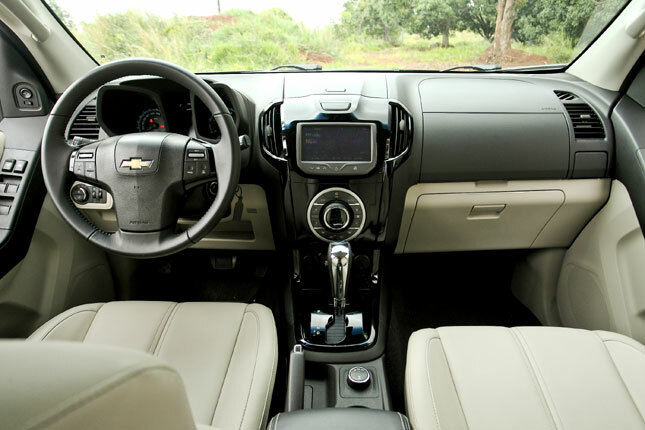 Unfortunately, despite coming with a very nice AVT multimedia system, you need to pay extra for dealer-fit options like GPS navigation and a backing-up camera. 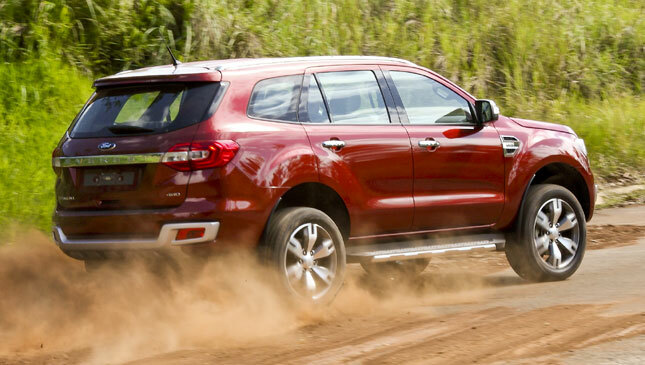 To sum it all up, the new Fortuner is a vast improvement over its predecessor. 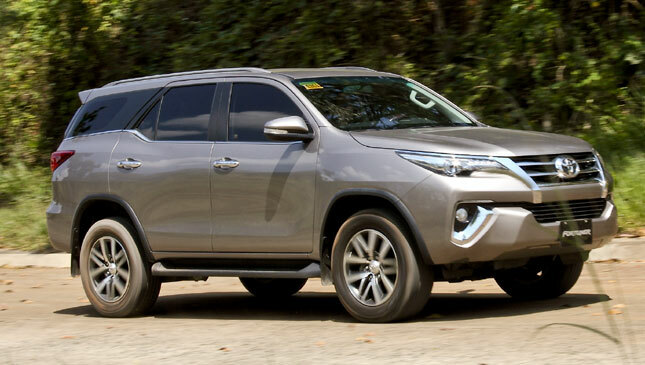 The others have upped their game, too, but thankfully, the Fortuner has one edge against its rivals: the Toyota name, and with it, a reputation for cars that are as reliable as death and taxes. Even better, the cars are now injected with excitement and drama never seen before. It all comes down to this--five midsize SUVs in a very closely fought segment. What makes determining the winner is that there's no such thing as a bad vehicle here. 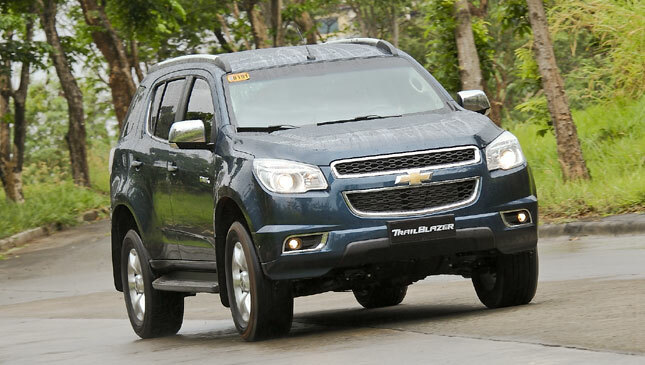 The Chevrolet Trailblazer brings with it fantastic performance--it's the quickest truck here. Unfortunately, that's all it has over the others. 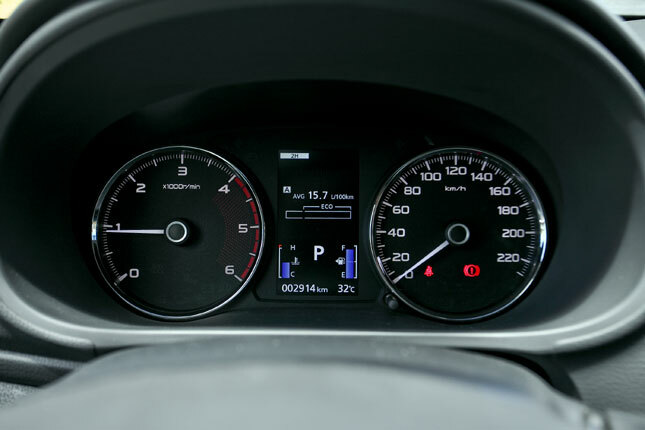 It also has the highest fuel consumption and is the oldest in the group. 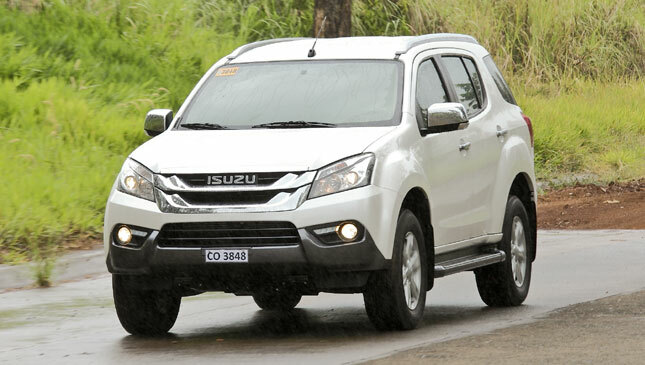 The Isuzu MU-X may be the least impressive in this bunch, but in terms of sales performance, it has the last laugh. 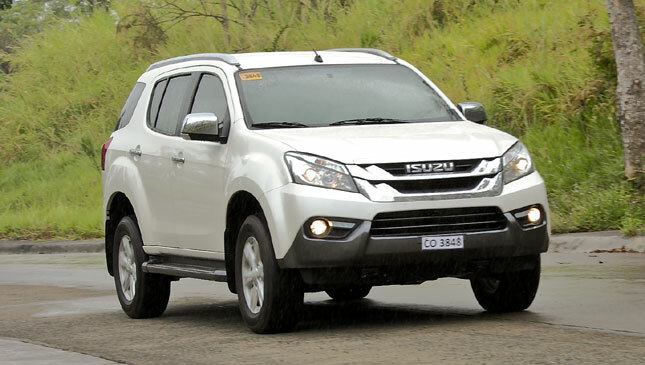 Isuzu's dealer network and parts availability are beyond comparison. The MU-X isn't as fancy as the others, but it's dependable. 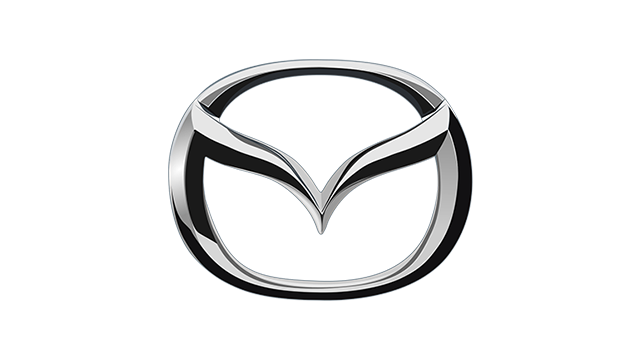 Most important, it finally gets an upgraded 3.0-liter engine. 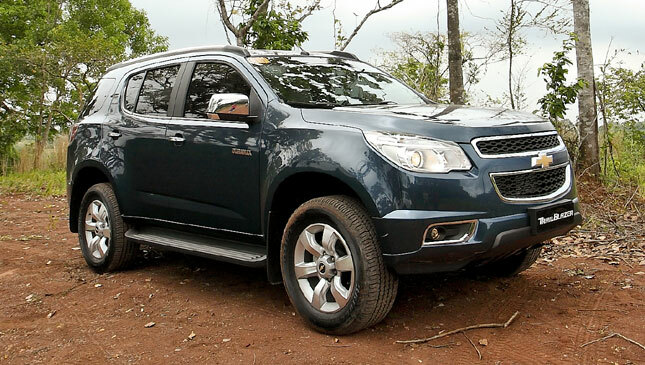 Still, the fact remains: The Chevrolet/Isuzu twins hardly have a fighting chance against newer competition. So we move on to the big three. 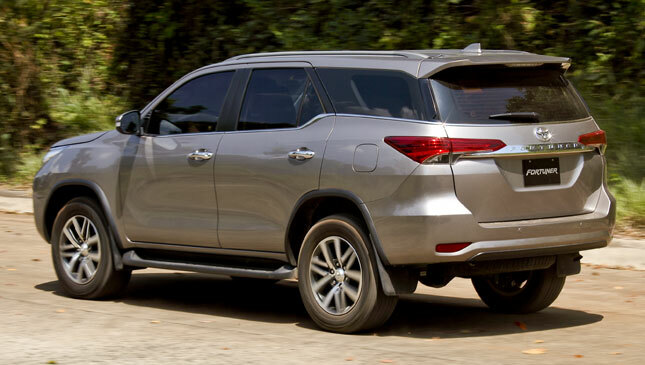 The new Toyota Fortuner has addressed the most common gripe with the previous model--the bumpy ride. It's smoother now, but not as smooth as that of the Everest or the Montero Sport. 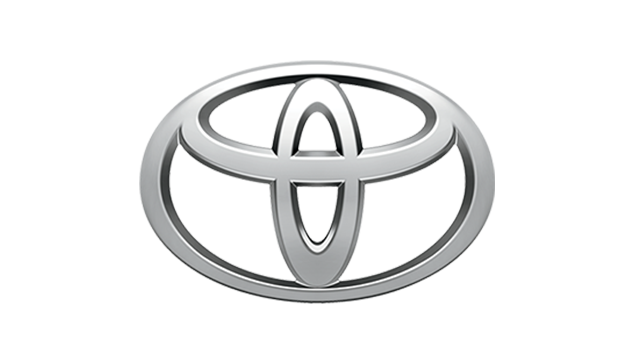 That said, Toyotas always draw strength from being good overall packages, so a single negative aspect isn't such a big drawback. 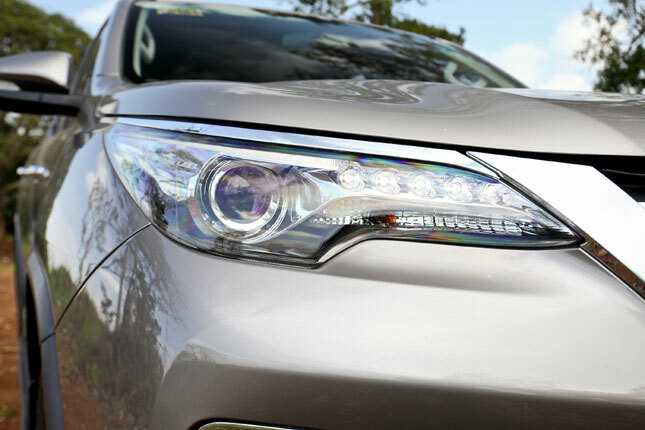 While the Fortuner is much more dynamic, it offers more of the same formula. The world's biggest carmaker simply won't mess with a proven formula. 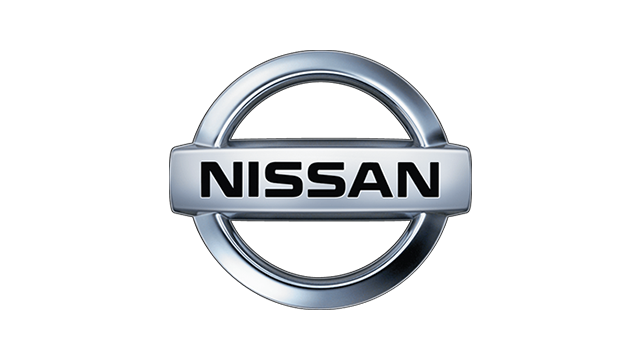 What's more, it's hard to top the brand's reliability and dealer network. 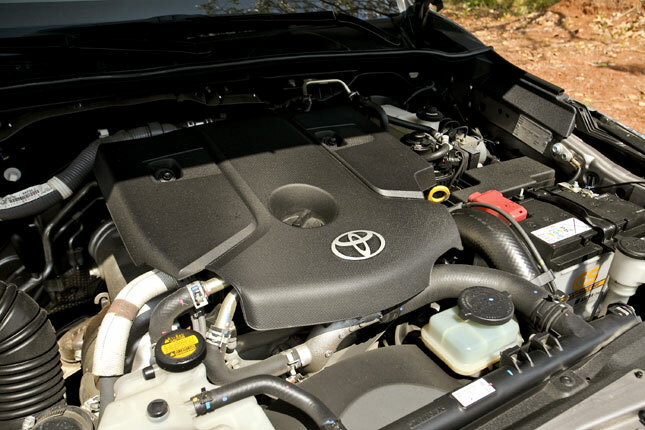 For most of its customers, after-sales service is a truly important consideration, which explains why Toyota can dictate its price. 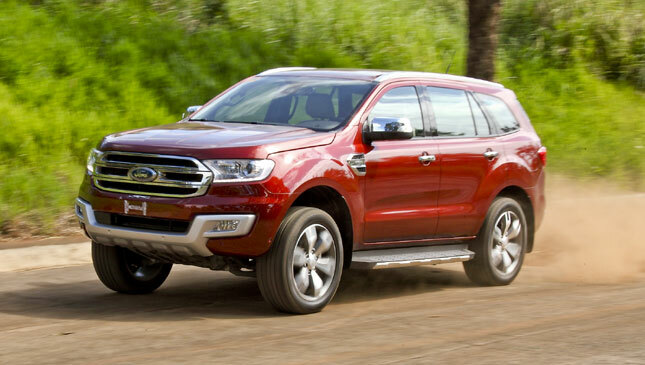 Beating the Fortuner by three vote points is the Ford Everest. 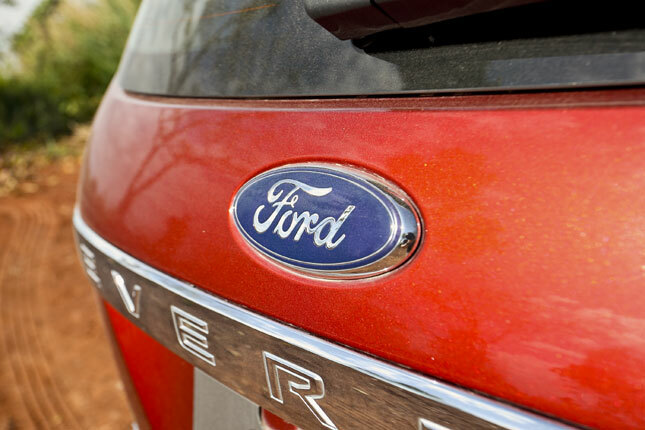 Ford certainly came out strong with this one with the clear intention of topping Toyota and Mitsubishi. It's a great product. 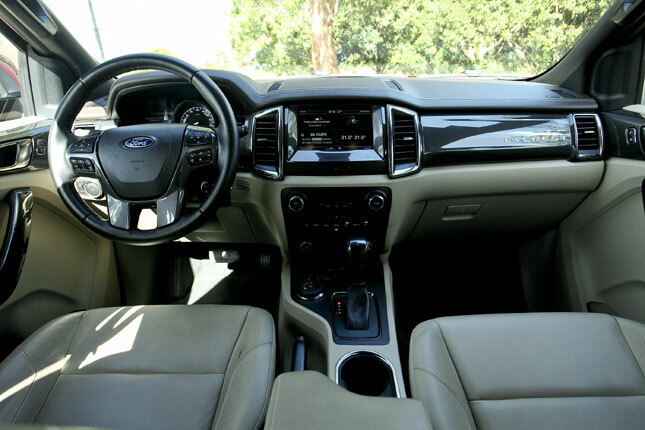 The exterior reflects the company's "Built Tough" mantra, the interior is opulent, and the ride is great. 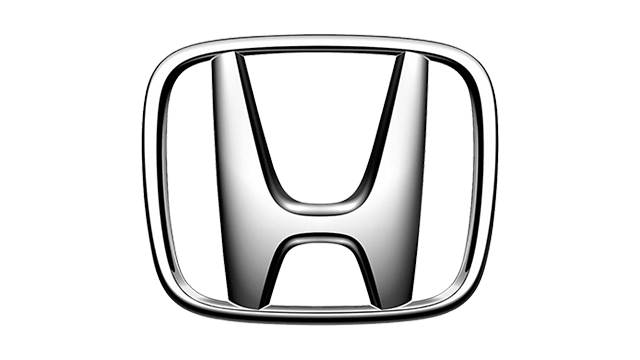 The downside is that there remain question marks with regard to reliability, especially with the engine ancillaries and the suspension. 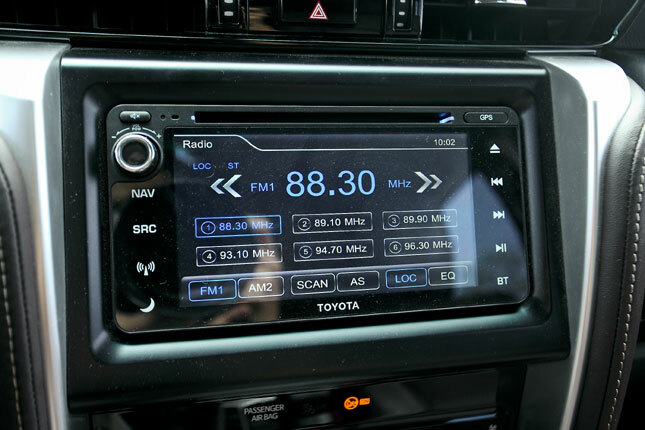 This vehicle is quite gimmicky, too, and the novelty of electronic features wears off over time. 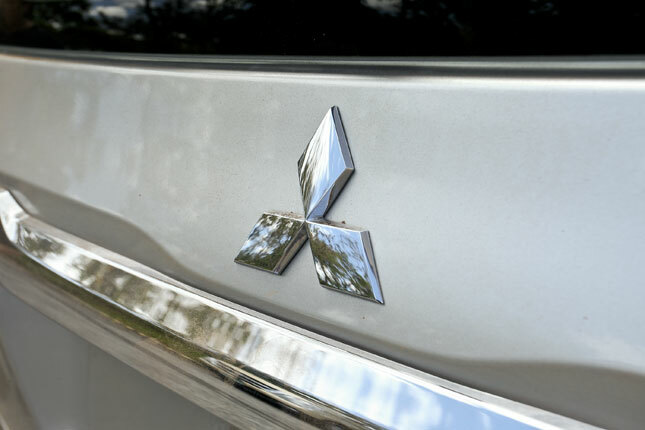 The clear winner here--by 15 vote points--is the Mitsubishi Montero Sport. The new model exceeds expectations. It beats the competition with clever engineering while still retaining its value-for-money proposition. Very forward-thinking from the brand. No wonder it is rewarded first-place votes by four out of the five-man Big Test team. 1st Everest Montero Sp. Montero Sp. Montero Sp. Montero Sp. NOTE: 10 points for first place, 7 points for second place, 5 points for third place, 3 points for fourth place, and 1 point for fifth place.